You have only seconds to get noticed! The Middle Career Resume Writing Service is for individuals with experience in any profession or industry, in a non-management role. 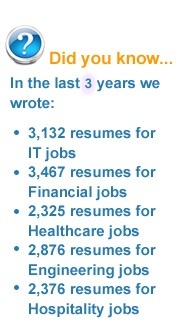 Get noticed by potential employers and hiring managers with an impressive resume. We are committed to providing you with the highest standard of service and resume expertise so you can achieve optimal results with your resume…multiple interviews leading to your next offer of employment. Resume Services on this page is for customers in the United States. U.S. customers pay no tax on services provided. Prices are in U.S. Dollar. Call 1.877.212.54441.877.212.5444 or email us for a free resume critique.